The posters in this gallery depict the animals and plants of the marine environment in New Zealand. In each creature we admire its shape, colours and adaptation to its way of life. 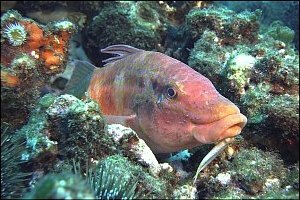 f020618 - A very old goatfish (Upeneichthys lineatus) in its personal shelter at the Poor Knights Islands, New zealand. f004715: A large male goatfish in spawning colours has taken a strategic position on a yellow boring sponge, 20m deep, near Leigh, New Zealand. 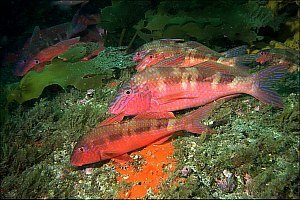 Goatfish (Upeneichthys lineatus) can change colour quickly, from dull grey to flamboyant red. f007700: This 30-year old snapper, endearingly called 'Mr Perfect', lives in the Goat Island marine reserve, New Zealand. Snapper (Pagrus auratus) are not only nice to eat but also nice to look at, growing to over 60 years and 15kg. 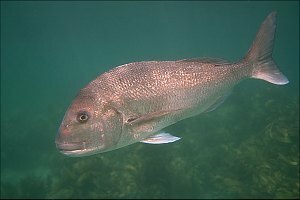 f017812: A large snapper photographed in the Goat Island marine reserve near Leigh, New Zealand. 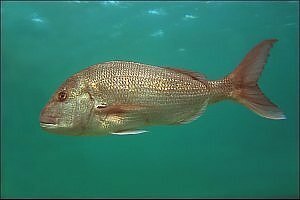 Sea bream or snapper (Pagrus auratus) can grow very old and attain a weight of over 15 kg. 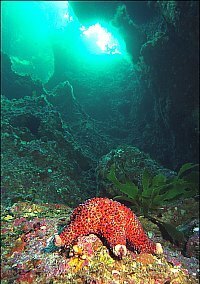 Inside the marine reserve, these large fish never fail to amaze visitors. 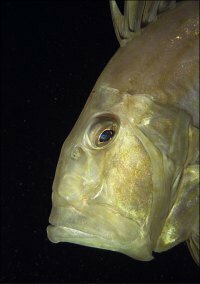 f021328: Surprised during its sleep, this john dory is a fierce predator by day. 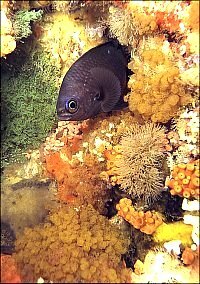 Many john dory (Zeus faber) visit the coast where they stalk fish. These hunters are very thin and almost invisible. When they strike, they extend their fold-out mouths far forward. f025013: A large variable sea hare was found feeding on sea lettuce at the Poor Knights Islands, New Zealand. 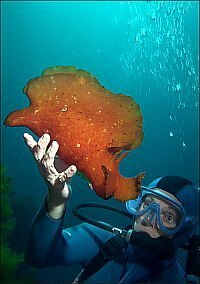 Variable seahares (Aplysia dactylomela) live in coastal, sheltered areas and are often found in rock pools. They grow fast because their bodies contain little substance. f020621: A male two-spot demoiselle has left its nest with eggs to sleep in a safe place between red calcareous algae in Nursery Cove, Poor Knights Is, New Zealand. Two-spot demoiselles (Chromis dispilus) occur in vast numbers near headlands where they catch planktonic crustacea with their flexible mouths and agile bodies. f022611: A group of goatfish resting at 15m depth, near Leigh, New Zealand. 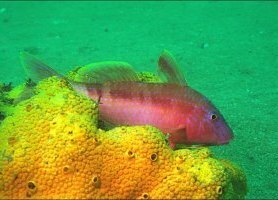 With their sensitive mouth barbels, goatfish (Upeneichthys lineatus) are very effective feeders, which gives them ample time for socialising and resting. f006901: A comb star crawling over volcanic sand near Mayor Island, New Zealand. 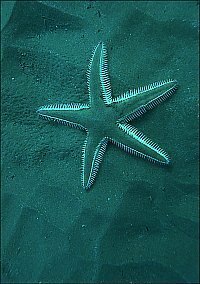 Comb stars (Astropecten polyacanthus) normally burrow to hunt for small creatures living in the sand. f012528: A demoiselle found sleeping at night in its colourful bedroom at the Poor Knights Is, New Zealand. 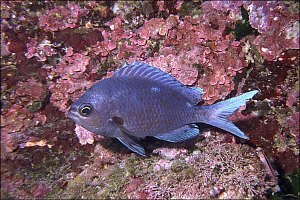 Demoiselles (Chromis dispilus) feed during the day in the open water near headlands and islands but return to their favourite sleeping dens at night. A firebrick star at the bottom of an ancient lava tunnel at Serpent Rock, Poor Knights Is. Firebrick stars (Asterodiscus truncatus) have rounded spines, coloured like a fired brick.